Saturday August 30 2008. Its now one week and one day after the door opened and the Little Owls were released. I placed the food on the hack board at 1934hrs BST. The weather was fantastic, no clouds and hardly a any movement of wind, and it was very warm in the early evening sun. This time there were no Little owls waiting inside the release aviary and I had clear view of the hack board where 6 dead day old chicks lay in wait to be eaten. At 1941hrs the first Little Owl appeared from my left and south of the release aviary, it had not come from far probably about 50-60 metres and roosting in the evergreen trees. Upon arrival it was not that confident, it certainly wanted the food but was quite wary of something. Note: this is great bit of behaviour showing that this Owl is not coming straight in with confidence but now does show some real wild behaviour. Finally after 11 minutes flying back and forward it took food and flew not away but back into the aviary with it and began eating. 1957hrs second Little Owl appears on top of the release aviary and after 4 minutes take a food but this times flies to my left and into the trees, and now out of sight. At 2012 hours there's now 3 owls inside and on the aviary, leaving one of course consuming in the trees, this now makes 4 back. The food disappears quickly with just 2 food items left. 2016hrs Little owl 5 flies in, this time however from behind me, flying over my head but again alighting on the roof of the aviary before quite quickly grabbing food and flying into the large Chestnut tree just right of the release aviary. And finally (with great relief) at 2022hrs Little owl number 6 flies in from the right and flying at speed grabs food off of the board and continues to fly some 100 metres away and I manage to get a picture of it but its now quite dark. They are still roosting quite local but the beginning signs are there of a breaking up of the group. Indeed I continued to monitor or rather listen as it was now very dark right up until 2300hrs. They became very vocal around 2245hrs there was obviously some verbal squabble going on. The calls were normal yelps and rasping and to my surprise spring song (which can be done at anytime of year) this song is done by the male, but when one of them started it was like all Little Owl hell broke lose, as they all vocalised together. This was interesting as 3 of them were obviously close to the release aviary, but the other 3 were around the paddock and though I could not see them they were obviously on the stone walls and fence posts. Its obvious that now 1 week after release they are operating much further away from the release aviary. There vocal interactions means they are becoming less tolerant of each other. We are probably not long now from seeing real distribution begin, which means monitoring further away from my comfortable very wet log. As per my last report on Swallows. This is just an update on the Swallows nest on Mendip (925 ft above sea level South west England) that I have been following as a part of World on The Move. The young have hatched for attempt number 4, Only 2 of the original 5 eggs have hatched and been reared to one week of age. The weather today has been much milder, and the 2 adults have been joined by additional adult Swallows in the surrounding fields. My hope is that the weather continues to improve then these 2 young will fledge successfully and one time before the Swallows head back to Africa. Interestingly the surrounding fields each morning have been filing with Wheaters, clearly they are already on the move south. Its one week since the door on the release aviary was opened. The Little Owls have not let me down with their antics. I predicted that they would begin to roost away from the aviary which they have indeed been doing. However towards the late afternoon the aviary has been filling up again with Little Owls until feeding time. By Wednesday (5 days after release) only 1 Little Owl was in the aviary come feeding time, which occurs around 1830 hours BST this being an hour or so before sunset (what sun, that's a joke) So I settled back on my watching log to monitor how many of the owls came back for food (dead day old chicks) that I placed out on the hack board. Well obviously the cheeky one inside the aviary came straight out some 10 minutes after I placed the food, grabbed a chick and went straight back inside to consume it. Now it takes time for a Little owl to eat one chick, all of around 4/5 minutes by my timings. Another Little owl appeared to my left headed for the hack board grabbed chick and flew straight up into the large tree next to the aviary, now though out of my view under heavy leaf canopy. Darn it, the mobile phone rang! I had to walk back to my car, and go to my diary to confirm a booking for a lecture. This took all of 12 minutes, ish. When I returned to settle back on my log I'm blowed if all the chicks had gone that's 6 of them. I missed the other owls returning but this proved they must have been close by. The next day (morning) I returned to the site and just sat and watched for any movement. No one was inside the aviary however there is a line of evergreen trees that spread to the south of the release aviary and my eye was drawn to these as one by one the Little Owls as in 6 of them revealed themselves every so often coming out of the evergreen to look around, and not seeing me 2 of them flew towards the aviary, to sit on top and chase insects, crane flys. Whilst another appeared quite close to me on a fence post concentrating on movement below it in the long grass. So to conclude, its good news and clearly. I will monitor them again over the weekend but all Little owls seem to be present and correct they are so far not venturing far from the release site, but that is to be expected. So one week after release as far as I'm concerned everything is on target and to plan. None of them have been seen by anyone over 300 metres from the release aviary, however that does not mean to say that when no ones looking they don't. It does give us a good indications that they are becoming more secure finding their own roost sites, and that observations of their hunting is increasing. This activity is though very local to the release site, which for us is great as we can still observe them. More to come on this story. Little Owl Release: The second night of freedom. No pictures tonight. I did do some audio but don't know how to upload a Wav file on to the blog (any help gratefully received). Just a short update to say that all Little Owls are present and correct, and they have hardly moved away, the furthest I have seen any of them from the release site is around 200 metres. When I arrived on site to put their food on the hack board 5 of them were back inside the aviary. No they were not waiting for food, according to the land owner they had all been around outside but come the later part of the morning were back inside. This is great, just what I wanted and means everything is going according to plan. They have indeed been out and about, it will take them time to establish roost sites outside and to get used to local dangers such as Crows etc. Just to reiterate this soft release method gives them the chance to establish being self supporting. I will reduce the food I give them if the weather stays good in about 7 days time by then they should be beginning to sort out their new surroundings. Its also great that the others are roosting outside yet really close by. Indeed they only showed themselves after I had retreated from the hack board and had waited hidden for over half an hour. I will continue monitor and update as the days pass. The Little Owls in this post started life in the wild, they have been found as orphaned (or what ever reason) and taken to Secret World who we work with closely. Finally the sun came out, and with the forecast looking good for the next few days it was time to release the Little Owls, a species which in the wild have had their best breeding season for over a decade here in southwest England. They came from Secret World (go to the link page at http://www.chrissperring.com/ for Secret World website), and given to us to release back into the wild. They have been in the portable release aviary now since July and the only thing stopping us from releasing them sooner has been the awful weather conditions. I had placed rotten logs in their aviary so they can teach themselves to catch insects and indeed this they had all achieved very quickly (I know this because I check their pellets regularly). I must admit to feeling guilty not releasing them sooner, but I wanted to give them the best possible start. In other words just a few days good weather. Now finally its come and so at 1830hrs this evening I placed their food not on the inside of the aviary as normal but this time on the outside, ensuring that the release hatch door was fully opened and secure so they could get at their food and of course when they did collect the food they would be free. Of all the worlds Owls, the Little Owl (Athene noctua) is the Marx Brothers of the Owl world (very comical yet intelligent). Within 10 minutes one the owls came out to the hack board, it could see its food, then ran along the board picked up food and ran for its sheer life back in the aviary. The release method I'm using is called soft release, this method I have been doing for along time. The soft release method means of course they are under no stress to leave, they are free, yet nothing pushes them. There are some pictures of this activity which I will put up with this post, but do look at the pictures taken around 2045hrs. OK I know there awful quality as its getting dark and the ISO on the camera is running at 3200, but one of the Little owls is now on a fence post some 50 metres away from the release aviary, that means its out and its hunting looking down into the grass from the fence post. Interestingly when this Owl spots me taking its picture where does it fly for security? The release aviary, as in back inside. This is good and does mean they know the now opened release aviary is place they can trust. As the weeks go by the amount of food that is put out for them will be reduced and they will become more self supporting. But of all the Owls and Bird of Prey we release Little owls have to be one of the very quick adjusters to life in the wild. I will update on how the gang is doing but for tonight they have now been left in peace to acclimatise to the new world that awaits them. I know some people will say "why didn't we telemetry track them" my answer is, we would love too, but can't afford too at present. We do however carry out monitoring of all released birds using Hawk and Owl Trust volunteers who are brilliant at taking up positions around release sites (sometimes in the dead of the night and reporting in their observations). I will update on the gang when I have some more information in the meantime here's the pictures from tonight. If want to donate towards telemetry tags or want to become a Hawk and Owl Trust volunteer please do let me know. Just when I thought it was not safe to look into yet another failed owls nest. Well there is some good news from the doom and gloom of this great British summer we are not having. Seems you can't keep a good Barn owl down, what I mean is that so many nest sites appeared to be doing nothing during the main part of the 08 breeding season, and even though the weather has not improved most of the early none breeding Barn owls are now, yes now in mid August going for it and beginning breeding. There has been some early success but the general trend is very reduced numbers fledging. So if they started with 5 eggs they are only fledging 2 owlets, or even only 1, and so far in the minority total failure. The main prey item the Short Tailed Vole in all my study plots is doing very well this year, so that's not the problem. The Owl though does not go out hunting in the pouring rain, and again as I write this late in the evening of the 18th August, outside it is very windy and the rain has not, or appeared to me not to have stopped all day. Now don't get the idea that its all doom and gloom because the pictures below show one brood from this year that have reared 4 Owlets these in a farmhouse in mid Somerset. Were as the other picture shows a young owlet too young to ring or band if your from the U.S.A, this owlet is the last from an original 5 owlets to have hatched. We have gained some new Barn owl sites this year in Somerset and from the county that used to called Avon, and of course have lost a few. But looking through the results so far it does seem that apart from low brood sizes, the overall picture is still quite good. Some of the new Barn owl nest sites are indeed interesting being located at higher altitude such as Mendip Hills. Were as the most loses have been from the traditional heart lands for this Owl such as the Somerset levels, here the surface water has stayed for longer. I will blog again soon, happy wildlife watching. I have been doing some work for the ground breaking BBC Radio 4 series called world on the move. This series looks in detail at migration of wild animals around the planet. Just thought I would share with you this story of a pair of Swallows I have been following on Mendip, Somerset, England. 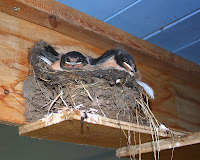 The Swallows arrived in mid April from Africa, they began making their first nest of 08 within three days of arriving. This summer has been a washout with high winds at times and of course what seems endless rain, the affect this has upon the main prey of the swallow "the flying insects" must have been devastating. The early brood of Swallows consisted of 5 eggs all hatched, however there must have been trouble rearing them to fledgling as quite often I would watch both parent birds sheltering from heavy rain as apposed to hunting. Only 2 from this brood seem to have made it, indeed I did find 2 dead young swallows just outside the building where they nested this incident again coinciding with what can only be described as a cloud burst of rain over Mendip. The parents birds made a new nest and laid a fresh clutch of 4 eggs, however the weather deteriorates further and maybe because of this we find all the eggs smashed on the ground. Note: we don't know for certain this was a response from the adults to the lack of food, however we assume this because of a worsening of the weather over this same period. By the beginning of August nest number 3 is now built very close to nest number 2. Yet another 6 eggs have been laid and so fingers are crossed to see whether this brood will be successful. In 07 the Swallows were gone by 27th September, it will be interesting to see if they leave earlier or maybe summer will come late as in September? The Swifts that normally live around my house in Portishead were gone by the last week of July this was only one week earlier than 07. Owls have also had mixed fortunes but its not all doom and gloom more on the Owls in the next blog. Just back from a week on Dartmoor. The scenery was stunning, that was when I could see it. I had a week of solid rain and low cloud. There was one day when I watched the sun go by almost like there was a hole in the sky for about 2 hours. Seriously though it was great to walk the Tors. I really liked Hound Tor (Hound of the Baskervilles location) there was something about this place that was almost magical. I have promised myself a return in the Autumn and on this trip I will photograph more of the scenes and the wildlife that lives here, this time I will also take the guitar for some inspiration for new songs. We are bound to have our summer in the autumn so rain won't be a problem. On the wildlife front there was not much on view because of the constant driving rain. On Thursday I went to see my great friends at the Barn Owl Trust, David and Frances Ramsden. They proudly showed me the fields they have purchased through a legacy they had received and David was showing off his new barn owl box design, to which I must say both fields and boxes look really great. The Barn Owl Trust through David and Frances have always worked very hard for the cause of the barn owl there website is well worth a visit go to my links page at http://www.chrissperring.com/ and have look at what they are doing, its well worth a visit. I will leave this now just a few pictures of Dartmoor. Well look at me. Said I would never do it and now here it is. The Chris Sperring Blog spot. My thanks to my friend Jenny Holden at Cumbria Wildlife Trust for pushing me into this. I will try and update this blog often as I now think this is a marvelous way of sharing some of things I get up to with others. However I'm off soon to Dartmoor to photograph Dippers paddle in a river and chill out etc. I have some news, in that August 2nd I'm playing Indiana Jones in a game of Its A Knock Out, this is raising money for the Wildlife Rescue charity Secret World. Also some great news for those followers of my work with Hawk and Owl Trust, (oh just realised I'm not allowed to tell anyone about that yet) On the music front we are still trying to pull the band together Lizzie Brown has now joined us on vocals, but its all my fault that we have not practised much of late, I have managed to find some time to write some new songs. The owl breeding season goes on and on, I find myself either at the top of a tree or chasing Voles through the long grass. I will blog more when I return from Dartmoor.